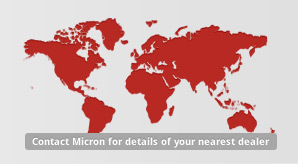 The Micron AU8120 atomiser has been developed from over 30 years’ experience in the design and use of rotary atomisers. Originally developed for agricultural aircraft, these atomisers are now used for ground applications in more than 75 countries. 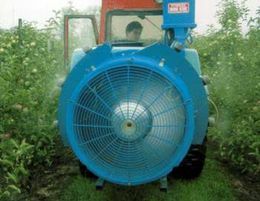 The AU8120 is intended for installation in a wide range of airblast sprayers for orchard, vineyard and public health applications. The versatile design allows quick and cost effective conversion to ensure that most airblast sprayers can benefit from state-of-the-art technology. In addition to installation in new airblast sprayers the AU8120 offers a new lease of life to old and tired sprayers. 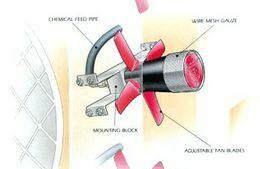 The atomiser uses a rotating woven wire gauze cage to break the chemical into droplets. This unique approach ensures that all the spray volume is concentrated into a narrow range of droplet sizes. The size of the spray droplets can be adjusted by varying the speed of the atomiser, thus producing the optimum size droplet for the chemical and application technique being used. Rotary atomisation technology offers commercial and environmental advantages to users who should see benefits immediately with major improvements in most aspects of crop spraying. The unique benefits of rotary atomisation ensure that where required the maximum number of “low-drift droplets” are produced. Along with correct installation and operation, the key to reducing drift is the ability to create a spectrum of low-drift droplets whose rate of fall is greater than the influence of local winds and updraughts. The AU8120 enables the operator to gain maximum control over the droplet size and therefore reduce drift to a minimum. Airblast sprayers are well known to be potentially hazardous to both users and the environment. The unique advantages of the AU8120 allow airblast sprayers to improve their spraying performance whilst keeping environmental damage to a minimum. Fan diameter depends upon air velocity and duct size.